Jazeman Jaafar has added four extra race weekends to his racing campaign for this year, contesting selected rounds of the FIA European F3 Championship to broaden his racing experience. The first of the four race meetings will be Brands Hatch, UK this coming weekend, with Red Bull Ring, Austria; Nurburgring, Germany and Zandvoort, Netherlands the other fixtures for the young Malaysian. Jaafar heads to Brands Hatch off the back of his best performance to date in the British F3 International Series. 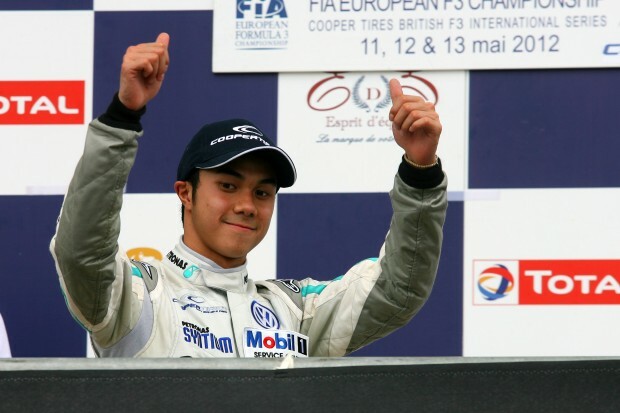 A victory and a second place at last weekend’s Grand Prix de Pau demonstrated the potential the young Malaysian has and showed his racing prowess against a 23-strong grid of top F3 drivers. The Brands Hatch event, supporting the British round of the popular DTM touring car championship, features two races on Saturday and a third on Sunday morning. The PETRONAS-supported driver says of his upcoming challenge, “I have never experienced the Brands Hatch Indy circuit and I have never driven with Hankook tyres which we’re running on for this event, so this will be a new challenge for me. I’m confident with the team I have behind me, so I shouldn’t take long to get up to speed. I know what lies ahead in terms of the level of competition and I know it’ll be close, competitive racing on this short lap layout at one of the best tracks in the UK. I’m so pleased that I’m back in the car so quickly after my last race weekend, as I just love being behind the wheel and out there getting as much as I can out of myself and my car. Jaafar’s weekend will start with a practice session and qualifying on Friday 18th May. The first race takes place on Saturday 19th May in the morning, with the second of the trio in the afternoon. The final race of the weekend will be on Sunday morning as a support to the DTM feature event later in the day.